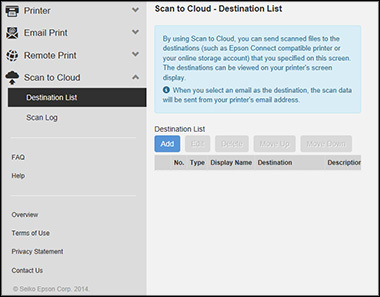 Follow the steps below to activate Epson Scan To Cloud and Epson Remote Print. Important: Your product needs to be set up with Epson Connect before you can use these services. If you need to set up Epson Connect, see Epson Connect Printer Setup. Sign in to your Epson Connect account. If necessary, select your product in the My Printer/Email List. 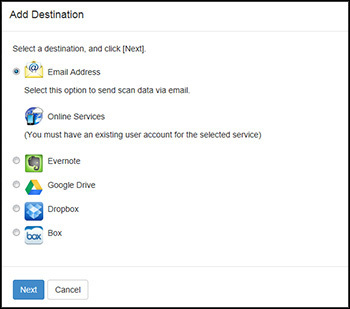 Expand Scan to Cloud, then select Destination List. Click Add. Select your destination, then click Next. Follow the on-screen instructions to set up the destination. Expand Remote Print, then select Print Settings. Check Enable Remote Print, then click Apply. Note: You can choose to assign an Access Key to allow only specific users to print with Remote Print.